Baton Rouge, Louisiana – Friday, May 12, 2017 – Lamar Advertising Company (Nasdaq: LAMR) today announced that Sean Reilly, CEO of Lamar Advertising Company, is scheduled to participate in a question-and-answer session at the 45th Annual J.P. Morgan Global Technology, Media and Telecom Conference in Boston, MA on Monday, May 22, 2017 at approximately 2:20 p.m. (ET). Founded in 1902, Lamar Advertising Company is one of the largest outdoor advertising companies in North America, with more than 330,000 displays across the United States, Canada and Puerto Rico. Lamar offers advertisers a variety of billboard, interstate logo and transit advertising formats, helping both local businesses and national brands reach broad audiences every day. 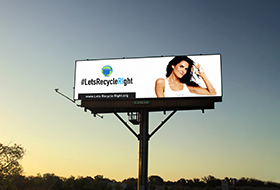 In addition to its more traditional out-of-home inventory, Lamar is proud to offer its customers the largest network of digital billboards in the United States with over 2,600 displays.